The Nature Conservancy and Disney partnered in 1993 to preserve 12,000 acres of natural habitat critical to the survival of many rare species. 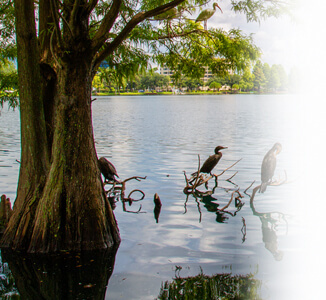 Visitors to the preserve, one of the most widely known Orlando nature parks can walk a 3-mile hiking trail or take an off-road buggy tour to see conservation in action. Lucky visitors can encounter Florida scrub jays, gopher tortoises, bald eagles and a number of other species as they travel through. Big Tree Park was home to one of Florida’s most famous natural landmarks. “The Senator” was a 3,500 year-old Bald Cypress Tree, believed by many to be the oldest living tree in the United States, but it was tragically lost to vandalism. Still, this gem among Orlando nature parks also features a peaceful boardwalk through natural marsh lands and a picnic area for families to enjoy a special meal in a natural setting. Set on the shores of Lake Louisa, Lake Louisa State Park offers a variety of activities to get you in touch with nature. The 4,000 acre state park offers fishing in four different lakes as well as designated trails for horseback riding. There are also campsites available for overnight guests. Visitors can see an abundance of wildlife along the trails, including White Tail Deer, Marsh Rabbits, Alligators and Bobcats. The marshy areas of the park are also home to many species of migratory birds. Rock Springs Run State Reserve offers 17 miles of hiking and horseback riding trails through a variety of native plant communities. As you travel, be on the lookout for Florida scrub jays, red-shouldered hawks and Florida black bears. Don’t worry though, the bears are shy and won’t bother hikers or riders. Call in advance, as trails are sometimes closed for maintenance. Naturally refreshing springs are one of the main attractions at this state park. Divers can swim deep into the underwater trench, only to be pushed back to the surface by the gentle push of the spring. Canoeing is also especially enjoyable at this park, with so many lakes and streams to paddle down. The park also features boating, camping, hiking, picnic areas and fishing.